Now available at every three - and all the other numbers, too! WHAT? Why are there TWO three o'clocks?! 24 hours in the day, and we have enough numbers to assign a unique one to each of them. 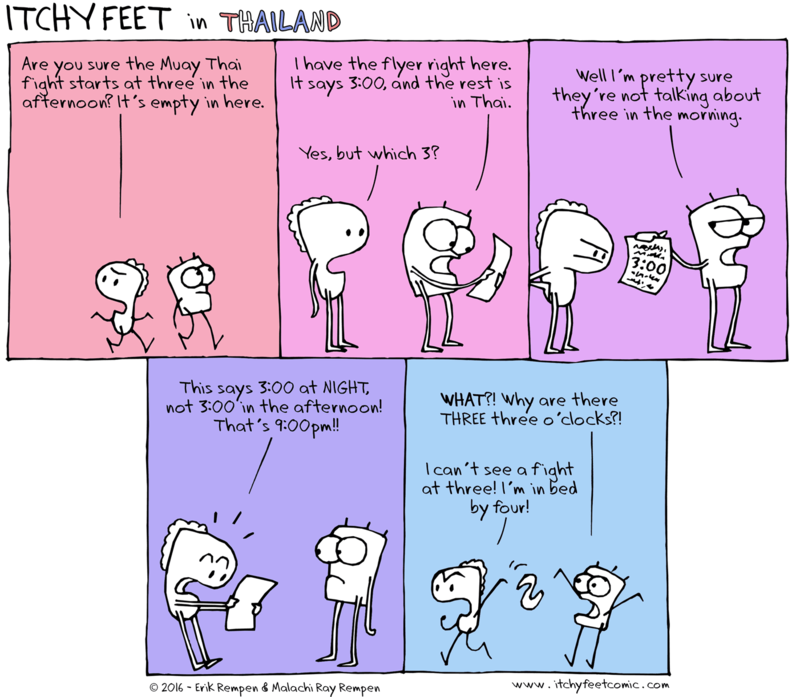 So do the thai divide a 24 hour day into 1 to 12 AM, 1 to 6 PM, 1 to 6 night? Crazy. So there are not three, but four three o'clocks in a day. Here in Germany its even worse, we divide the day into 24 one-hour periods! and then someone comes with "viertel drei" and people arrive at six different times (2:15, 2:45, 3:15, 14:15, 14:45, 15:15). Thank goodness, four equal periods makes far more sense than only 3 3 o'clocks. The dude in the Cartoon only knew of two 3 o'clocks from the 12 hour system. Then he was informed of another at 9pm thus he was exasperated why there suddenly seemed to be 3!. Crazy 6 hour clock. Different strokes for different folks. Great comics here thanks Malachi.